Leawo iPad 4 Data Recovery software is the best data recovery tool for lost data on iPad 4. 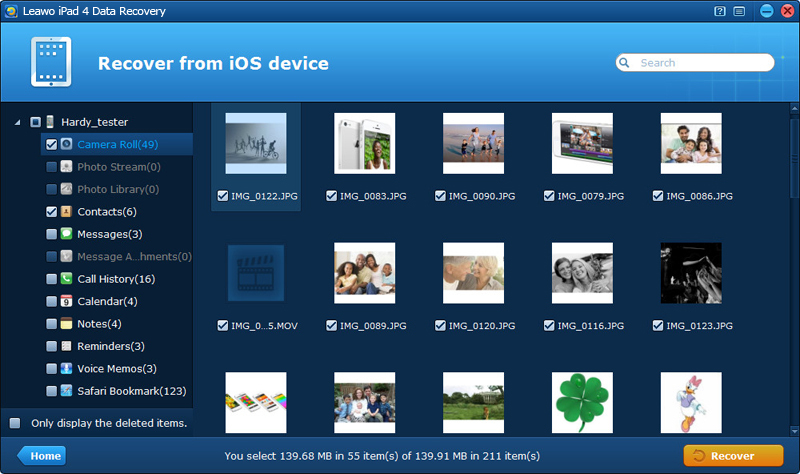 With it, you can retrieve up to 12 types of data, such as camera photos and videos, messages, contacts, notes, etc. Leawo iPad 4 Data Recovery is the best-of-all iOS data recovery tool to retrieve lost Camera Roll photos and videos, Photo Library, Photo Stream, messages, contacts, notes and many more directly from the devices or from iTunes backups. You can achieve iPad 4 data recovery quickly and safely by deep scan and analyzing of the iPad 4 or by extracting previous iTunes backups. Digital photo recovery and image recovery software to effectively recover lost, deleted, corrupted or formatted photos, images, videos and audio from for local drives and removable devices, SD/memory card, USB/local drive, camera, and mobile phone. EZ Backup Word Pro makes it easy to backup your Microsoft Word Documents to a local drive, network folder, CD/DVD and even to a remote FTP server! Presto Transfer Windows Live Mail helps transfer your mail and and address book from one computer to another. AlmerBackup is a fully automatic backup software loaded with features. It supports Zip compression, has built-in scheduler and can back up data to local drive, network drive, external drive, floppy, CD and even ftp-server. Get your copy now!